As always seems to be the case, the marquee move of the summer transfer window was left to the final day, with Virgil van Dijk's long-touted switch to Southampton from Celtic finally being completed. The £13m fee, along with the £2m paid by Sunderland for fellow defender Adam Matthews, suggests that the Scottish champions once again emerged from summer dealings having made a profit. Striker Nadir Ciftci, from Dundee United, and defender Dedryck Boyata, from Manchester City, arrived for about £1.5m each, while Celtic still had some spare change to purchase centre-back Jozo Simunovic from Dinamo Zagreb and midfielder Ryan Christie from Inverness Caledonian Thistle on the final day of the window. County under Jim McIntyre continued where Derek Adams left off in previous seasons with the biggest turnover of staff along with Motherwell, where an incredible 23 players passed through the exit door in the wake of their close shave with relegation. On balance, Celtic, Aberdeen, St Johnstone, Dundee, Kilmarnock and Hearts appear to have stronger squads than last season, while Inverness Caledonian Thistle, Dundee United, Hamilton Accies, Partrick Thistle and Motherwell seem to be starting the season weaker. With all those changes at Victoria Park, it is a guessing game to decide on which side of that line County's new squad will fall. Marquee signing: Danny Ward is only on loan from Liverpool, but the former Wales Under-21 goalkeeper is so highly regarded that he immediately displaced Scott Brown and Jamie Langfield from the first team, with the latter's long stay at Pittodrie looking likely to come to an end soon. Key arrival: Having utilised natural centre-half Andrew Considine, admittedly somewhat successfully, at left-back, Dons manager Derek McInnes has drafted in a much-lauded specialist in Graeme Shinnie from Premiership rivals Inverness Caledonian Thistle. The 23-year-old decided against extending his career-long stay at Caledonian Stadium, where he has also shown his versatility on the right and in midfield. One that got away: Russell Anderson's injury enforced retirement not only deprives the Dons of the former Scotland international's influence on the pitch but - along with Donvervon Daniels' return to West Brom - leaves them short of cover in central defence. In: Graeme Shinnie, defender (Inverness Caledonian Thistle); Paul Quinn, defender (Ross County); Joe Nuttall, forward (Manchester City). Loan: Danny Ward, goalkeeper (Liverpool); Josh Parker, forward (Red Star Belgrade); Ryan McLaughlin, defender (Liverpool). Out: Jamie Langfield, goalkeeper (St Mirren); Joe Shaughnessy, defender (St Johnstone); Nicky Low, midfielder (Dundee); Clark Robertson, defender (Blackpool); Declan McManus, forward (Fleetwood Town); Andrew Driver, midfielder (De Graafshap); Kieran Gibbons, midfielder (Livingston); Craig Murray, defender (East Fife); Russell Anderson, defender (retired); Lewis Dunbar, defender; Jamie Masson, midfielder; Cem Felek, defender; Ritchie Petrie, midfielder; Marcus Campanile, midfielder; Michael Jones, forward. Loan: Lawrence Shankland, forward (St Mirren); Danny Rogers, goalkeeper (Falkirk). Loan ended: Donervon Daniels, defender (West Bromwich Albion). Prediction: 2nd. Derek McInnes has had to reduce the size of his squad, but those shed were on the fringes while the new additions increase the number capable of competing for starting places and, if anything, they are better prepared to mount a title challenge. Marquee signing: Celtic manager Ronny Deila moved quickly to plug the gap in central defence left by Jason Denayer's return to Manchester City. Indeed, the Norwegian will hope that it is a like-for-like swap as the 19-year-old prospect has been replaced by more experienced fellow Belgian international Dedryck Boyata. The 24-year-old has been in cold storage for much of his career in England but has already looked a stand-out in the heat of the Champions League qualifiers. Key arrival: Ronny Deila's priority will have been a quality striker. John Guidetti's star faded long before the end of the Swede's loan from Manchester City and Celtic have had to rely on Leigh Griffiths, who has yet to prove himself in Europe. The Celtic manager will hope he can channel Nadir Ciftci's talents in a positive direction after the controversial Turk's switch from Dundee United. 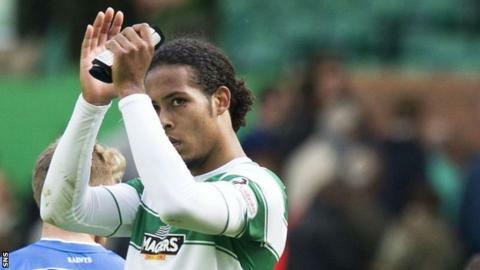 One that got away: Virgil van Dijk eventually got the move to England for which he had been pushing what seems like ever since he joined Celtic from Groningen. And Celtic will probably be happy to receive £13m for the Dutch central defender who has still to fully convince at the top level despite the hype surrounding him. In: Jozo Simunovic, defender (Dinamo Zagreb, undisclosed); Ryan Christie, midfielder (Inverness Caledonian Thistle, undisclosed); Nadir Ciftci, forward (Dundee United, £1.5m); Dedryck Boyata, defender (Manchester City, £1.5m); Saidy Janko, defender (Manchester United, compensation); Scott Allan, midfielder (Hibernian, £275,000); Logan Bailly, goalkeeper (OH Leuven, undisclosed). Loan: Tyler Blackett, defender (Manchester United). Out:Stephen Frail, youth coach;Virgil van Dijk, defender (Southampton, £11.5m); Adam Matthews, defender (Sunderland, £2m); Teemu Pukki, forward (Brondby, undisclosed); Jackson Irvine, midfielder (Ross County, compensation); Amido Balde, forward (Metz); Joe Chalmers, defender (Motherwell); Dylan McGeouch, midfielder (Hibernian, undisclosed); Jordan Hart, goalkeeper (Annan Athletic). Loan: Ryan Christie, midfielder (Inverness Caledonian Thistle); Stefan Scepovic, forward (Getafe); Darnell Fisher, defender (St Johnstone); Stuart Findlay, defender (Kilmarnock); Liam Henderson, midfielder (Hibernian); Paul McMullan, forward (St Mirren); Eoghan O'Connell, defender (Oldham Athletic); Jamie Lindsay, midfielder (Dumbarton); Conor McManus, midfielder (Alloa Athletic); Michael Duffy, forward (Alloa Athletic); Calum Waters, defender (Dumbarton). Loan ended: Jason Denayer, defender (Manchester City); John Guidetti, forward (Manchester City); Aleksandar Tonev, midfielder (Aston Villa); Wakaso Mubarak, midfielder (Rubin Kazan). Prediction: 1st. Aberdeen benefited from a stuttering start to Ronny Deila's managerial reign at Celtic Park. The Norwegian has made steady progress since and, despite their own advances, it will be a surprise if the Dons can stay in touch for so long again this season. Marquee signing: More was made in the media of the acquisition of Rory Loy from Scottish Cup finalists Falkirk, but Kane Hemmings more than matched his fellow former Rangers youth's Championship scoring rate while with Cowdenbeath and arrives with a year's experience in England's tough second tier with Barnsley behind him. Key arrival: Fellow defender Kevin Holt cost compensation money from Queen of the South, but former Real Sociedad centre-half Julen Etxabeguren Leanizbarrutia, who spent last season with lowly East Fife, is the biggest name - if only courtesy of its length. Paul Hartley will hope that they and others recruited from the lower leagues will make a step up in a similar fashion to player of the year nominee Greg Stewart. One that got away: Winger Jim McAlister rejected a new contract after three years at Dens Park, while experienced goalkeeper Kyle Letheren would have provided quality competition for Scott Bain, but instead of staying to battle for his place, has left in search of the regular first-team football he hopes will win him a place in the Wales squad. In: Kane Hemmings, forward (Barnsley); Nick Ross, midfielder (Inverness Caledonian Thistle); Rory Loy, forward (Falkirk); Kevin Holt, defender (Queen of the South, compensation); Nicky Low, midfielder (Aberdeen); Daryll Meggatt, defender (Alloa Athletic); David Mitchell, goalkeeper (Stranraer); Julen Etxabeguren Leanizbarrutia, defender (East Fife). Loan: Riccardo Calder, midfielder (Aston Villa); Rhys Healey, forward (Cardiff City). Out: David Clarkson, forward (Motherwell); Jim McAlister, midfielder (Blackpool); Kyle Letheren, goalkeeper (Blackpool); Martin Boyle, forward (Hibernian); Paul Heffernan, forward (Queen of the South); Kyle Benedictus, defender (Raith Rovers); Kevin McBride, midfielder (Airdrieonians); Willie Dyer, defender (Brechin City); Jamie Reid, midfielder (Arbroath); Calum Brodie, goalkeeper (Arbroath); Luka Tankulic, forward; Phil Roberts, forward; Iain Davidson, midfielder; Simon Ferry, midfielder. Loan: Craig Wighton, forward (Raith Rovers); Cammy Kerr, defender (Peterhead); Matty Allan, defender (Montrose). Loan ended: Alex Harris, midfielder (Hibernian). Prediction: 4th. Paul Hartley was the first out the traps with his batch of summer signings and his forward planning and yet another overhaul of his squad should ensure more steady progress at Dens Park. Marquee signing: Billy Mckay made his name in the Scottish top flight with Inverness Caledonian Thistle, but it has not worked out for the striker at Wigan Athletic. Now the 26-year-old is hoping to regain his scoring form on loan at Tannadice having found himself behind fellow Northern Ireland international Will Grigg at the DW Stadium. Key arrival: Darko Bodul is a direct replacement for the departed Nadir Ciftci and the former Ajax trainee arrives with top-flight experience in Portugal with Nacional, Denmark with Odense and Austria with Sturm Graz, then, for the last six months of last season, Rheindorf Altach. One that got away: United bowed to the inevitable and sold Nadir Ciftci to Celtic after the striker refused a contract extension beyond next summer. However, the loss of Jaroslav Fojut for nothing because of the Pole's homesickness is potentially a greater one considering he stood out in an otherwise suspect defence. In: Darko Bodul, forward (Rheindorf Altach); Coll Donaldson, defender (Queens Park Rangers); Mark Durnan, defender (Queen of the South, compensation); Justin Johnson, midfielder (FC United of Manchester). Loan:Billy Mckay, forward (Wigan Athletic); Adam Taggart, forward (Fulham); Aaron Kuhl, midfielder (Reading). Out: Nadir Ciftci, forward (Celtic, £1.5m); Jaroslaw Fojut, defender (Pogon Szczecin); Radoslaw Ciernziak, goalkeeper (Wisla Krakow); Calum Butcher, midfielder (Burton Albion); Brian Graham, forward (Ross County); Michael Gardyne, forward (Ross County); Keith Watson, defender (St Mirren); Darren Petrie, midfielder (Raith Rovers); Jamie Montgomery, forward (Brechin City); Kudus Oyenuga, forward (Hartlepool United); Rodney Sneijder, midfielder. Loan: Robbie Muirhead, forward (Partick Thistle); Henri Anier, forward (Hibernian). Prediction: 7th. United have been on a downward trajectory since the January sale of Stuart Armstrong and Gary Mackay-Steven to Celtic and Nadir Ciftci's summer departure to the Scottish champions suggests Jackie McNamara has his work cut out to halt the decline. Marquee signing: Former Troyes and Sheffield United striker Christian Nade returns to the Scottish top-flight five years after leaving Hearts and having had a modest goal tally for Dundee, then Raith Rovers, in the Championship. Key arrival: Latvia left-back Antons Kurakins spent three years with Celtic without making a first-team breakthrough but has another chance to make his mark in the Scottish top-flight after helping Ventspils win the title in his homeland two years in succession. One that got away: Stephen Hendrie has headed to the English top flight with West Ham United, although Accies do earn some compensation money for the Scotland Under-21 left-back's development. In: Jamie Sendles, defender (Queens Park Rangers); Alex D'Acol, forward (AEK Athens); Antons Kurakins, defender (Ventspils); Christian Nade, forward (Raith Rovers); Gramoz Kurtaj, midfielder (Banik Most); Chris Turner, midfielder (Dumbarton); Alan Martin, goalkeeper (Clyde). Loan: Carlton Morris, forward (Norwich City). Out: Stephen Hendrie, defender (West Ham United, compensation); Nigel Hasselbaink, forward (Excelsior Rotterdam); Jon Routledge, midfielder (Dumbarton); Darren Smith, midfielder (Livingston); Blair Currie, goalkeeper (Annan Athletic); Jason Scotland, forward; Salva Chamorro, forward; Kieran MacDonald, defender; Danny Armstrong, forward. Loan: Nico Sumsky, midfielder (Airdrieonians); Andy Ryan, striker (Arbroath); Craig Watson, defender (Arbroath). Prediction: 11th. Access went into a steep decline after Alex Neil's switch to Norwich City in January. New manager Martin Canning managed to arrest the decline after the split for the final round of matches and that will need to be continued if they are to avoid relegation trouble. Marquee signing: He was the talk of Tynecastle for much of the summer before Nigeria left-back Juwon Oshaniwa finally arrived on a three-year contract. Having played for his country at the 2014 World Cup and played three years in Israel's top flight, Oshaniwa comes with a big reputation. Key arrival: Despite running away with the Championship title last season, Hearts are still looking for a prolific striker and will be hoping they have found one in Juanma Delgado, who arrives from Kalloni in Greece. One that got away: Captain Danny Wilson preferred to remain in the Scottish Championship by returning to Rangers instead of agreeing a new contract to follow Hearts into the top flight. However, replacement Blazej Augustyn has plenty of top-flight experience with Legia Warsaw, Rimini, Catania, Vicenza and then Gornik Zabrze in his homeland. In: Juwon Oshaniwa, defender (Ironi Ashdod); Juanma Delgado, forward (Kalloni); Blazej Augustyn, defender (Gornik Zabrze); Igor Rossi Branco, forward (Maritimo); Gavin Reilly, forward (Queen of the South, compensation); Jahmal Howlett-Mundle, defender (Crystal Palace); Dario Zanatta, midfielder (unattached). Out: Kevin McHattie, defender (Kilmarnock); Scott Robinson, midfielder (Kilmarnock); Brad McKay, defender (St Johnstone); Dale Carrick, forward (Kilmarnock); Jason Holt, midfielder (Rangers, compensation); Gary Oliver, forward (Queen of the South, undisclosed); Danny Wilson, defender (Rangers); Barry Hogg, midfielder (Berwick Rangers); Jake Hutchings, defender. Loan: Liam Henderson, defender (Stenhousemuir); Alistair Roy, forward (East Stirlingshire). Loan ended: Genero Zeefuik, forward (Groningen). Last season: 1st in Championship and promotion. Prediction: 3rd. Having only dropped into the Championship because of financial meltdown and a points deduction, Hearts won the title and promotion at a canter despite the presence of neighbours Hibernian and big-spending Rangers. Robbie Neilson's squad has been bolstered by some promising foreign talent and should make the top six. Marquee signing: That Owain Fon Williams, albeit a former Wales Under-21 international, is Caley Thistle's most notable summer signing is perhaps an indication of the budget at manager John Hughes' disposal. The 28-year-old former Stockport County and Bury goalkeeper left Tranmere Rovers after their relegation from England's League Two to the Conference. Key arrival: Andrea Mbuyi-Mutombo's record suggests that the Belgium-born CR Congo striker is unlikely to prove the striker John Hughes has been seeking. However, the versatile forward who began his senior career with Portsmouth has already amassed experience in the Belgian top-flight with Zulte-Waragem, Standard Liege, Sint-Truiden and Cercle Brugge, in Croatia with Rijeka and Istra 1961, the downside being he has spent the last season in the French third tier with Frejus St-Raphael. One that got away: Aberdeen-bound Graeme Shinnie was primarily a left-back, but he filled in at vital times on the right too and manager John Hughes will have his work cut out to find a replacement with such versatility and quality. In: Brian Rice, assistant manager (Al Khor); Andrea Mbuyi-Mutombo, forward (Frejus St-Raphael); Nat Wedderburn, midfielder (Cowdenbeath); Dani Lopez, forward (La Roda); Jordan Roberts, midfielder (Aldershot Town), Owain Fon Williams, goalkeeper (Tranmere Rovers); Iain Vigurs, midfielder (Motherwell). Loan: Miles Storey, forward (Swindon Town); Tobi Sho-Silva, forward (Charlton Athletic); Ryan Christie, midfielder (Celtic). Out: Russell Latapy, assistant manager; Ryan Christie, midfielder (Celtic, undisclosed); Marley Watkins, midfielder (Barnsley); Graeme Shinnie, defender (Aberdeen); Nick Ross, midfielder (Dundee); Tarmo Kink, forward (Levadia Tallinn); Ryan Baptie, defender (Peterhead); Edward Ofere, forward. Prediction: 5th. John Hughes has lost two of his top performers and budget restrictions mean they have not been properly replaced. Yet Caley Thistle showed enough in losing to Astra in Europa League qualifying that there remains a unit capable of producing quality football. Marquee signing: Kris Boyd, the Scottish Premier League's record goalscorer, will be hoping that a return to Kilmarnock can again revive his career. If his third spell at Rugby Park is to do so, it will have to be more productive than his second with Rangers, the 31-year-old finding himself consigned to the bench for much of the Ibrox side's failed promotion bid in the Championship. Key arrival: It was a surprise that Jamie MacDonald found himself in the Championship last season with Falkirk after being a victim of Hearts' financial problems. However, form that helped the Bairns to the Scottish Cup final has ensured his return to the top flight. One that got away: Kilmarnock will also be shorn of Alexei Eremenko's midfield artistry, but they might miss more the leadership provided by exited captain Manuel Pascali, although the influence of both was diminishing as age got the better of them. In: Scott Robinson, midfielder (Hearts); Dale Carrick, forward (Hearts); Kevin McHattie, defender (Hearts); Kallum Higginbotham, forward (Partick Thistle); Lee McCulloch, defender/coach (Rangers); Kris Boyd, forward (Rangers); Jamie MacDonald, goalkeeper (Falkirk); Stevie Smith, defender (Rangers). Loan: Stuart Findlay, defender (Celtic); Oliver Davies, goalkeeper (Swansea City). Out: Manuel Pascali, defender (Cittadella); Lee Miller, forward (Falkirk); Paul Cairney, midfielder (Stranraer); Euan Smith, midfielder (Brechin City); Craig Samson, goalkeeper; Alexei Eremenko, midfielder; Sammy Clingan, midfielder; Nathan Eccleston, forward; Chris Chantler, defender; Mark Thomson, forward; Dylan Pooler, forward. Loan: Devlin MacKay, goalkeeper (Derby County); Conor Brennan, goalkeeper (Stranraer). Prediction: 12th. Gary Locke struggled to keep Kilmarnock clear of relegation trouble last season. Pre-season performances suggest he might have found the key to a brighter season, but much may depend on whether Kris Boyd can rediscover his scoring touch. Marquee signing: Scott McDonald isn't a new signing, but the former Celtic and Australia striker looked for a time like he might continue his globe trotting after completing his short, second spell with Motherwell before signing a new deal. Key arrival: Having paid a fee to Wrexham for the 23-year-old Louis Moult's services, Motherwell manager Ian Baraclough obviously has faith that the striker can build on his record of 23 goals in 37 starts for the Conference club in the Scottish Premiership. One that got away: The exit of Lee Erwin to Leeds United not only deprives Motherwell of one of their main striking threats from latter part of last season but also a player who had yet to reach his full potential. In: Louis Moult, forward (Wrexham, undisclosed fee); Louis Laing, defender (Nottingham Forest); David Clarkson, forward (Dundee); Wes Fletcher, forward (York City); Joe Chalmers, defender (Celtic); Kieran Kennedy, defender (Leicester City); Theo Robinson, forward (Doncaster Rovers). Loan: Connor Ripley, goalkeeper (Middlesbrough); Jake Taylor, midfielder (Reading); Liam Grimshaw, midfielder (Manchester United). Out: Lee Erwin, forward (Leeds United, compensation); John Sutton, forward (St Johnstone); Stuart Carswell, midfielder (St Mirren); Bob McHugh, forward (Falkirk); Steven Higgins, forward (Queen of the South); Morgyn Neill, defender (Livingston); Nathan Thomas, midfielder (Mansfield Town); Max Currie, goalkeeper (Stranraer); Ross Stewart, goalkeeper (Albion Rovers); Simon Ramsden, defender (Gateshead); Paul Lawson, midfielder (Formartine United); Josh Watt, midfielder (Cumnock); Iain Vigurs, midfielder; Fraser Kerr, defender; Zaine Francis-Angol, defender; Adam Cummins, forward; Craig McCall, midfielder; Daniel McNulty, defender; Liam Anderson, midfielder. Loan: Craig Moore, striker (Ayr United). Loan ended: Conor Grant, midfielder (Everton); George Long, goalkeeper (Sheffield United); Mark O'Brien, defender (Derby County); Anthony Straker, defender (York City). Prediction: 9th. Ian Baraclough has continued to replace the misfiring squad he inherited from Stuart McCall with players he knows from England's lower leagues. Unless he can find success with that Terry Butcher-style formula, it could be another season of struggle at Fir Park. Marquee signing: Mathias Pogba has been living in the shadow of his younger brother, Paul of Juventus, and his own twin, Florentin of St Etienne, and the 24-year-old striker will be looking to resurrect the scoring form that won him a move from Crew Alexandra to Pescara before a return to England with Crawley Town, who were relegated from England's League One. Key arrival: Tomas Cerny has been given the task of matching the success in goal of Scott Fox, who left for Ross County. The Czech made his name in Scotland's top flight with Hamilton but spent last season as an unused substitute with Hibernian in the Championship. One that got away: Stephen O'Donnell was an increasingly impressive presence at right-back but has preferred to move to England's League Two with Luton Town. In: Gary Miller, defender (St Johnstone); Tomas Cerny, goalkeeper (Hibernian); Mathias Pogba, forward (Crawley Town); David Amoo, midfielder (Carlisle United); Callum Booth, defender (Hibernian), Mustapha Dumbuya, defender (unattached). Loan:Robbie Muirhead, forward (Dundee United). Out: Kallum Higginbotham, forward (Kilmarnock); Scott Fox, goalkeeper (Ross County); Jack Hendry, defender (Wigan Athletic, undisclosed); Stephen O'Donnell, defender (Luton Town); James Craigen, midfielder (Raith Rovers); Ben Richards-Everton, defender (Dunfermline Athletic); Dale Keenan, midfielder (Stranraer); Conrad Balatoni, defender; Ryan Finnie, defender; Chris Dillon, midfielder. Loan ended: Lyle Taylor, forward (Scunthorpe United). Prediction: 10th. Partick Thistle continue to struggle financially with their rivals in the Premiership. Uninspiring summer signings suggest they will struggle, but pre-season performances hint that they could defy the odds again. Marquee signing: Jim McIntyre moved quickly to re-shape his squad in his first summer in charge in Dingwall, even managing to pay a fee - a rarity in Scottish football - to Queen of the South for midfielder Ian McShane, who will be hoping to repay that faith by proving he can step up a division. Key arrival: With Richard Brittain preferring to exit for Highland League champions Brora Rangers, new signing Andrew Davies, the former Bradford City defender, has been named captain. The defender brings a wealth of experience - Southampton paying £1m for him in 2007 - and was a regular in England's League One last season. One that got away: Paul Quinn had developed into a steady presence at right-back for County, but the 30-year-old was enticed east to high-flying Aberdeen. In: Ian McShane, midfielder (Queen of the South, undisclosed fee); Jackson Irvine, midfielder (Celtic, compensation); Scott Fox, goalkeeper (Partick Thistle); Brian Graham, forward (Dundee United); Andrew Davies, defender (Bradford City); Michael Gardyne, forward (Dundee United); Stewart Murdoch, midfielder (Fleetwood Town); Richard Foster, defender (Rangers); Darren Holden, defender (Hartlepool United); Jonathan Franks, midfielder (Hartlepool United); Chris Robertson, defender (Port Vale); Martin Woods, midfielder (Shrewsbury Town). Loan: Gary Woods, goalkeeper (Leyton Orient). Out: Paul Quinn, defender (Aberdeen); Antonio Reguero, goalkeeper (Hibernian); Ruben Palazuelos, midfielder (Guijuelo); Mark Brown, goalkeeper (Dumbarton); Darren Barr, defender (Dumbarton); Steven Ross, forward (Dumbarton); Jake Jervis, forward (Plymouth Argyle); Graham Carey, midfielder (Plymouth Argyle); Darvydas Sernas, midfielder (Zalgiris Vilnius); Richard Brittain, midfielder (Brora Rangers); Joe Cardle, midfielder (Dunfermline Athletic); Scott Ferries, midfielder (Peterhead); Terry Dunfield, midfielder; Benedict Frempah, defender; Abdoulaye Meite, defender; Steven Saunders, defender. Loan: Kyle Macleod, forward (Elgin City). Loan ended: Daniel Bachmann, goalkeeper (Stoke City); Filip Kiss, midfielder (Cardiff City); Cameron Burgess, defender (Fulham). Prediction: 8th. Jim McIntyre has completely reshaped his squad in a similar fashion to Derek Adams. The present County boss will be hoping that he doesn't also have to follow his predecessor by having to do the same in January when his first batch failed to gel. Marquee signing: John Sutton scored 13 goals in a struggling Motherwell side last season despite looking leg weary and Saints manager Tommy Wright will be hoping the 31-year-old can be galvanised by a team that are making the top half of the table their regular home. Key arrival: At 28, Liam Craig should be in his prime, but the midfielder only made 22 starts for Hibernian in the Championship last season and will be hoping to rediscover the form he showed in his previous spell at McDiarmid Park. One that got away: Danny Swanson added a missing element of creativity and unpredictability to the St Johnstone midfield but has returned to Coventry City after his loan ended. In: John Sutton, forward (Motherwell); Liam Craig, midfielder (Hibernian); Graham Cummins, forward (Exeter City); Brad McKay, defender (Hearts); Joe Shaughnessy, defender (Aberdeen); Greg Hurst, midfielder (Stirling Albion). Loan: Darnell Fisher, defender (Celtic). Out: Gary Miller, defender (Partick Thistle); Lee Croft, midfielder (Oldham Athletic); Frazer Wright, defender (Dumbarton); James McFadden, forward; Matthew Buchanan, defender; Rhys Evans, defender. Loan: George Hunter, forward (Airdrieonians); Connor McLaren, midfielder (Elgin City); Kyle Lander, forward (Stirling Albion); Mark Hurst, goalkeeper (Elgin City); Liam Gordon, defender (Elgin City); George Hunter, forward (Elgin City), Gareth Rodgers, defender (Ballymena); Scott Brown, midfielder (Dumbarton); Ally Gilchrist, defender (Peterhead); Jason Kerr, defender (East Fife); Jordan Millar, goalkeeper (Montrose). Loan ended: Brian Graham, forward (Dundee United); Danny Swanson, midfielder (Coventry City). Prediction: 6th. Tommy Wright's side were poor in losing to Alashkert in Europa League qualifying and have already lost midfielder Murray Davidson to long-term injury. The return of Liam Craig to midfield could add the element of flair that has been missing to what has become a dogged, no-nonsense unit.